The cyclist's historic run of Tour de France championships made headlines, as did his fall from grace after being stripped of the titles in 2012. Lance Armstrong's admission to Oprah Winfrey that he used performance-enhancing drugs to roll to cycling stardom puts him in some pretty bad company. After years of denying the accusations, Armstrong came clean in the Oprah interview, NBC News has confirmed. He now joins such disgraced names as Richard Nixon and John Edwards, who were exposed as liars to the American public. Is there any way he can ever restore his once pristine reputation? Probably not. Winning back the public trust at this point would rival the Tour de France in its difficulty. But, if Armstrong does want to try, here are six suggestions from experts on how he can try to accomplish the impossible. After this latest round of controversy, the best thing for Armstrong to do might be to disappear for a while. Allow the public to forget about the worst accusations, said longtime crisis publicist Howard Bragman, vice chairman of Reputation.com. Nailing that one interview is crucial, however, and in Armstrong’s case it’s not yet clear how it went. While Winfrey offered a teaser of her two-and-a-half hour interview Tuesday on CBS, she declined to comment on whether or not Armstrong was contrite and what exactly he revealed. NBC News, along with other outlets, has reported that Armstrong confessed to taking performance enhancing drugs in his interview with Winfrey. An admission of guilt opens up the potential for a flurry of new lawsuits against the cyclist – practically guaranteeing that he stays in the news. The key is to avoid magnifying those headlines with personal appearances. Let your army of suits do the work for you. New York Daily News columnist Mike Lupica talks about Armstrong's revelation that he did take performance-enhancing drugs after years of denials, calling it a "giant athletic Ponzi scheme," and attorney Lisa Bloom discusses the legal implications. Unlike other sporting legends whose public personas hit the skids, Armstrong might be able to boost himself on the merits of the prominent cancer charity he founded, but from which he has had to distance himself. 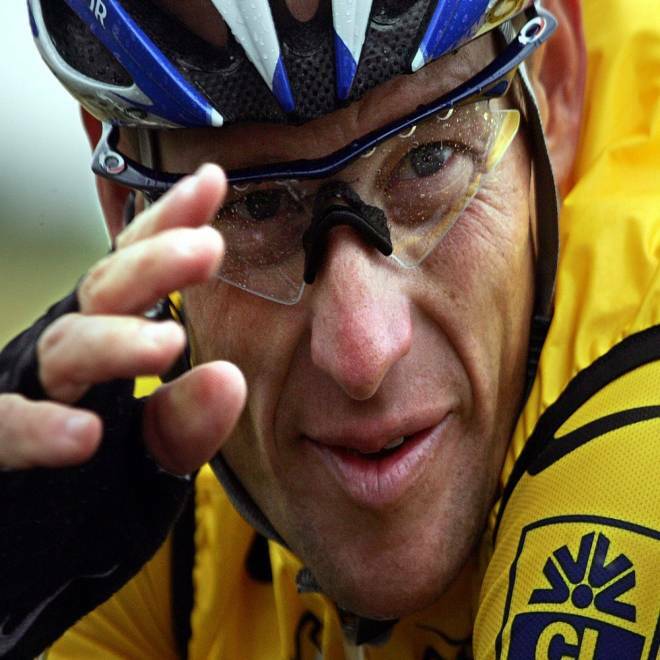 For years, Armstrong’s public persona was inseparable from the Livestrong Foundation. In October, he stepped down as chairman of the charity known for its yellow wrist bands. Yet, Armstrong remains closely tied to the group’s activities in the minds of many, and the sports star may be able to make the most of that. In many ways, Armstrong’s case is unique. Unlike stars whose sexual indiscretion or predilection for dog fighting brings them down, the use of performance-enhancing drugs undermines the main reason he was in the spotlight – his athletic prowess. Strangely, Armstrong’s path back to some measure of respectability could follow former President Richard Nixon’s after the Watergate scandal: Put your head down, go where you are needed, and grind away in your work until public opinion begins to shift. Armstrong was the face of cycling for many Americans, and to the average man or woman on a bicycle, that may be all that matters, especially when many people suspect his competitors were doping too. Despite denials made in interviews and a deposition, legendary cyclist Lance Armstrong has come clean about using performance-enhancing drugs. NBC's Anne Thompson reports on his admission to Oprah Winfrey. Florida veterinarian Michael Herman, 55, said it was watching Armstrong pedal that got him on the bike in 2003. He rode in five Livestrong events in Austin, Texas, with Armstrong and other supporters of the charity. Despite all the controversy, Herman said he still watches videos of Armstrong’s past performances with dropped jaw. While Armstrong may be impatient to move beyond his apparent admission of guilt, finding his way back into the public’s warm embrace will take time, said Peter Flax, editor-in-chief of Bicycling magazine. “I think it really is going to be dependent on his commitment to the process,” Flax said.